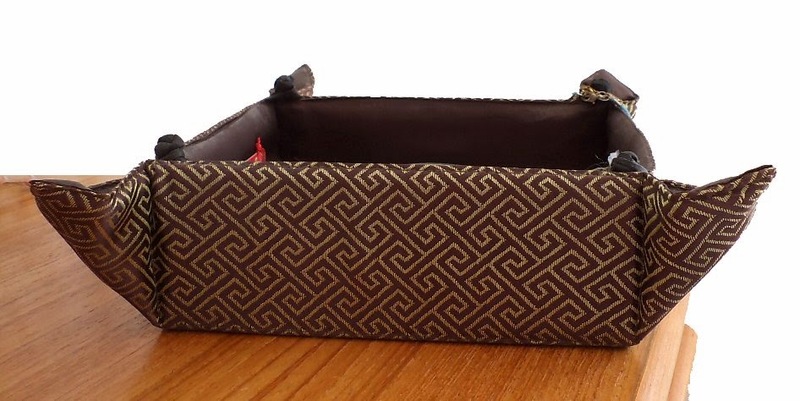 Many years ago, my parents received a set of three (square-shaped) collapsible fabric trays as a gift. At some point, the largest one was given to me and I have had it on top of my dresser for as long as I can remember. It was always something that I looked at and thought, boy, wouldn't it be handy to have one of these in a smaller size to take with me when I travel? And after I took up the hobby of craft sewing a couple of years ago, I looked at it again and and wondered if I couldn't make one for myself. I did find some tutorials, but what stopped me each time was the fact that they all seemed too complicated for the payoff. I just wanted somewhere to toss my jewelry every night. The idea of spending several hours making something to satisfy that simple purpose didn't appeal to me. Thus was born my Cutting Corners Collapsible Travel Tray... yes, it's a mouthful. (And it was likely the start of my whimsical naming theme of thinking that "adding a little bit of alliteration is almost always awesome".) I introduced the project in my sixteenth post and it has become the second most popular entry on the blog, mainly from being featured by AllFreeSewing.com on various occasions. I recently clicked on the link for the Cutting Corners tray at AllFreeSewing and found this review. I have no issues with "not positive" reviews of my work or ideas. Admittedly, I have led somewhat of a charmed life and have not had to deal with much negativity coming my way, but I operate on a pretty even keel and understand that people have different opinions and are entitled to them. When someone decides to give me the thumbs down but doesn't make much of a case for why it was necessary or helpful to share that opinion (what you see above is the "full review"), it's hard to be bothered. But I do find it oddly curious. It's kind of like making someone a dish of macaroni and cheese and then having the person say "meh", while adding that you could have made lasagna instead. To follow this person's lead, I could say, "Even easier, just use the paper hats that come on top of drinking glasses." Which was what I did before I came up with this idea! The ratings/comments on AllFreeSewing are generally quite kind and positive. (These are free projects, after all!) It's rare to see ratings that are three stars or less and in the majority of those cases, they are left after someone is frustrated with some sort of technical difficulty with accessing the tutorial itself. On a more encouraging note — I found this item about the Cutting Corners tray on Bags by Cate (who has a great selection of handmade bags that she sells at markets somewhere in Australia, I'm guessing). Last summer, I created PDFs for every one of my free tutorial projects. If you're interested in the PDF for the Cutting Corners Collapsible Travel Tray, head on over to my Craftsy shop.